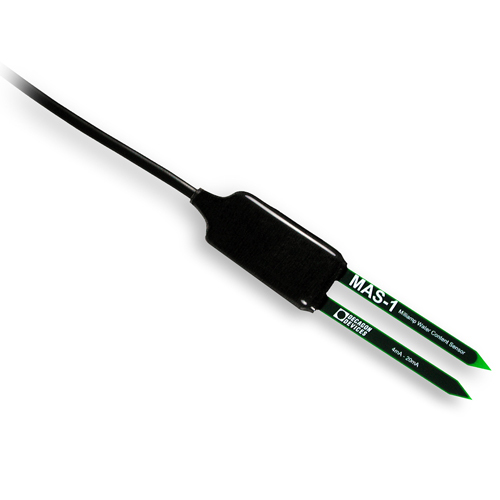 The 250-40561 MAS-1 Soil Moisture Sensor offers a standard 4-20 milliamp output that is common with PLCs and irrigation controllers. With the 4-20 mA interface, cable lengths over 250 feet are possible. The MAS-1 determines volumetric water content (VWC) by measuring the dielectric constant of the media using capacitance/frequency domain technology. The sensor uses a 70 MHz frequency, which minimizes salinity and textural effects, making the MAS-1 accurate in almost any soil or soil-less media. Factory calibrations are included for mineral soils, potting soils, and rockwool. The MAS-1 delivers research-grade accuracy at a price that makes large sensor networks economically practical. You can adequately characterize your site with sensors at multiple depths and locations, even if you're on a tight budget. Accuracy: ± 6% VWC with generic calibration for supported growing media up to 65% VWC, above which accuracy lessens. Increased accuracy can be achieved with a medium-specific calibration. Cable: 2 m or 5 m, 3 wire (22 AWG tinned Red and Black wire, 24 AWG tinned bare wire); custom cable length available upon request.